Swedish Massage is a basic relaxing full body massage which may include a variety of massage strokes such as rolling, kneading, and percussion to help the body improve circulation. Swedish may also include range of motion stretching. The benefits of this type of bodywork are wide-ranging and include relief from aches and pains, decreased stress levels in the body, enhanced mental clarity, and greater flexibility. A deep tissue massage is a type of massage therapy that focuses on working deep layers of muscle and connective tissue instead of the superficial layers. 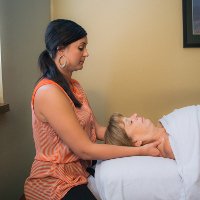 A massage therapist uses many of the same strokes used in a Swedish massage, but the movements are much slower and deeper pressure is applied. There are also other techniques that may include TP and MFR that are used to release muscle tension. These techniques enhance function, aid in the healing process, decrease muscle reflex activity and promote relaxation. Prenatal Massage is a full body massage during the 2nd and 3rd trimesters that is gentle and relaxing. This massage eases many of the pains and discomforts of pregnancy. It is nurturing and has been proven to help improve sleep and shorten labor.Great for baby too! Trigger point therapy is concentrated finger pressure to "trigger points" (painful irritated areas in muscles) to break cycles of spasm and pain. It appears that most muscular pains have a trigger point that causes the muscle to go into spasms. Trigger Point Therapy involves placing pressure on that trigger point so that the muscle can relax and the pain can be lessened. Pressure is generally applied with fingers, knuckles, and elbows. This form of therapy is often followed by stretching the muscles. The basic idea is that the trigger point which is the source of the pain is not always where the patient feels the pain. The trigger point could be several inches away from the place where they feel the discomfort or pain. Sports massage focuses on muscles relevant to the event. For athletes who train continuously, the goal is to enhance endurance, lessen the chance of injury and shorten the time needed to recover from an event.Sports Massage may utilize a variety of techniques such as classical Swedish Massage, trigger point therapy, and hydrotherapy. Prior to an athletic event, Sports Massage may be used with stretching in order to help athletes to loosen, warm and prepare their muscles so that their performance and endurance might be enhanced. Medical Therapeutic massage increasingly is being prescribed by physicians to complement traditional medical treatment for illness, injury rehabilitation and pain. Massage therapy is the scientific manipulation of the soft tissues of the body for the purpose of normalizing those tissues and consists of manual techniques that include applying fixed or movable pressure, holding, and/or causing movement, relief of tension-related conditions, such as headaches and eyestrain, promotion of faster healing of soft tissue injuries,reduction in pain and swelling related to such injuries, and reduction in the formation of excessive scar tissue following soft tissue injuries.